I've been prepping with various aspects of the project, so I've decided to hit the Month of Marsh theme pretty heavy. So here's my start! Started working on my second Fomorian. (Fimir. Whatever you'd like to call it.) 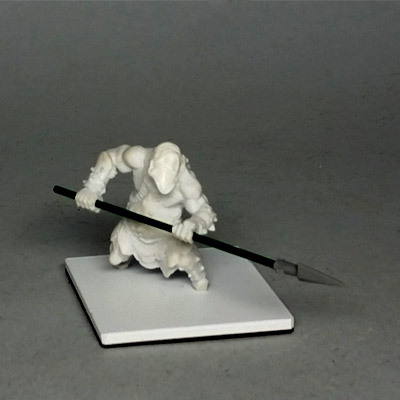 Reaper Bones orc with spear (unless otherwise noted, they're all Tre Manor sculpts.) I cut the spear, feet, and head off. Replaced the spear with a less, er, flaccid one (a bit of heavy florist wire and a plastic spear head from some old Citadel kit.) The head is one of my recent castings, and the tail -- which isn't really visible -- is one that I sculpted but don't have an inclination to cast. I still need to sculpt the feet, and do a bit of sculpting to blend the head with the body a bit. And lastly, I dug out some old boggy themed figures (already painted) to find a home with the Fomorian raiders. I have two more of the smaller mud elementals (old Crucible figures from Ral Partha) that I've already base coated. 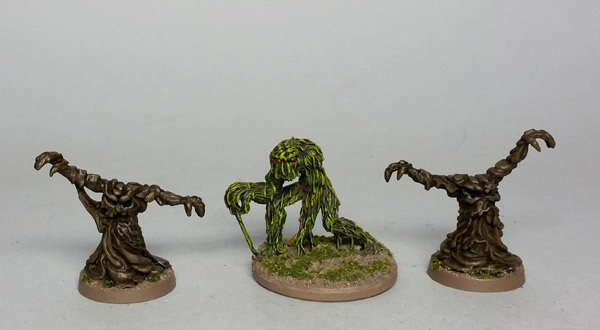 I can't recall where the "Swamp Thing" looking guy in the middle came from. At some point these may get rebased. Nice body choice there! Good and gangrel. I'd say don't do the feet, leave him submerged to the knees in bog! I love that Bod Demon. The variations of green, especially toward the extremities, are amazing and realistic. And the water effects on the base really add the final topper. Thanks. 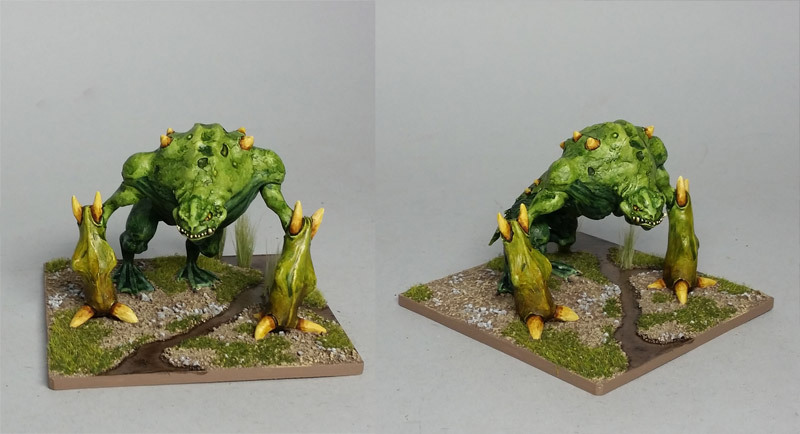 The painting on the bog demon was an experiment in washes & glazes. I'm trying to expand my range of techniques. Someone else suggested leaving the feet submerged as well. I'll have to think about it. It may not look like it, but right now he's resting on his heels -- I simply cut the front part of the feet off for re-sculpting . I second that idea about the feet. I looked at the picture and thought "he's got no feet, ah, of course, he's wading through the marsh - how clever". Then I scrolled down and found it was unintentional.